Representative Jered Taylor, R-Nixa, is sponsoring H.B. 1936, which would allow Conceal and Carry permit holders to take their guns onto campuses of state institutions of higher education. “I think by allowing these ‘gun-free zones,’ individuals know that they can go into those locations, not be stopped for any reasonable amount of time. They know they can go and carry out their sexual assault and not be stopped for any reasonable amount of time,” Taylor said. His bill is not just about college campuses; the 17-page bill also lifts restrictions on guns in churches, bars, daycares, and some public locations, like local municipal buildings and state buildings. At a committee hearing a few weeks ago, several universities testified against the bill. Opponents say college kids are often impulsive and emotional—and that allowing firearms to mix with that drama is asking for trouble. Taylor says society needs to take the kid gloves off and start treating college students as adults. “We do that with everything else when they turn 18. In Missouri state law, they are considered an adult when it comes to the court system,” Taylor said. We checked in with a couple of heavyweight colleges in our area. “We don’t want amateurs playing Barney Fife,” said Dr. Hal Higdon, president of Ozarks Technical Community College. He opposes the bill and says he believes it’s a clear case of overreach by the state government into local matters. “I find it ironic that our legislators, who bemoan the federal government’s interference with state matters, resort to the same tactics when it comes to local matters. And we do not feel it’s appropriate for the state legislature to tell local governing bodies like OTC what the policy should be,” said Higdon. OTC has its own police force, the members of which are POST certified—that means they meet the standards of the state regulatory commission that oversees the training of law enforcement. The college also has off-duty officers from city, sheriff, and federal law enforcement agencies in the Ozarks with guns on campus. Additionally, Higdon said, campus safety officials are concerned that more guns would lead to more confusion. “Just because you have a Conceal and Carry [permit] doesn’t mean you’re wearing a white hat and the bad guy’s wearing a black hat,” he said. If there were two people who each pull a gun, he says, how would security officers know which one was the initial shooter? “Our security and the police force would then see two guns, and we would have two people, then, who would probably be fired upon. So it’s really just not an intelligent way to go about it,” Higdon said. 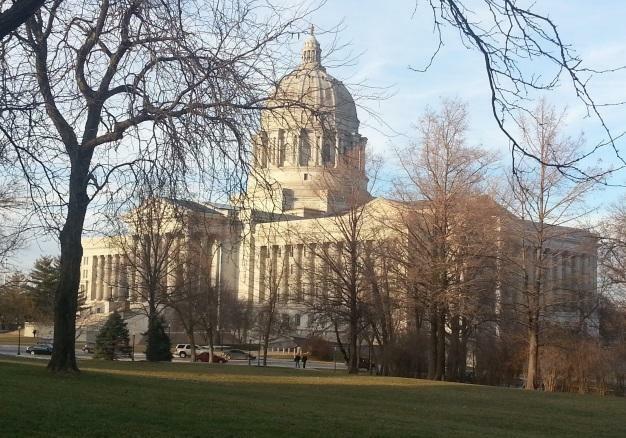 Missouri State University, where KSMU is based, also opposes this legislation. “Frequently we hear, ‘Well, it’s a gun-free zone.’ I always say, ‘Missouri State is not a gun-free zone,’” said Ryan DeBoef, chief of staff for MSU president Clif Smart. MSU has a police substation staffed by Springfield Police Department officers, for example, and off-duty law enforcement officers carry here, too. MSU, like many universities, has its own Possession of Firearms Policy. It prohibits students, staff, faculty, and guests from having firearms and ammunition on campus—unless they are given authority to do so by the president of the university. But there are exceptions to that ban. For example, peace officers, retired police officers, and civil process servers can carry guns on campus. DeBoef says Missouri State University also has a mechanism for other people requesting permission to carry a firearm on campus. “That permission is not give easily. It’s not just given to anybody who asks. But if somebody presents a very good reason why they need to be able to carry a firearm on campus, we do give them permission to do that,” DeBoef said. And, he says, MSU has its own weapon, figuratively speaking, against situations that could potentially escalate into violence: it’s called the Behavior Intervention Team. “And the goal of the Behavior Intervention Team is to take the various people throughout the university that interact with troubled students. That includes representatives from the university’s Counseling Center, Residence Life, and various academic units that interact with students. And all these representatives sit down regularly and go over red flags in students’ case files—mental health crises or serious disciplinary problems. It’s a preventative measure, and for student wellness, DeBouf said. Ryan DeBouf at MSU in Springfield says if Taylor’s bill were to clear both chambers and be signed into law, it would be a dramatic change. “I only say: the university will comply with the law. That is true on this bill. That is true on other bills that we may or may not agree with as well. But we will comply with the law,” DeBoef said. Back in Jefferson City, Representative Taylor’s bill has already passed the General Laws Committee, and now it goes before the Rules Committee. If it makes it across that hurdle, it will likely appear on the House floor for debate.